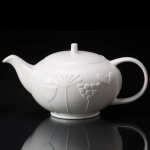 REPEAT REPEAT TEAPOT – The Plum Teapot is part of Repeat Repeats white bone china range with raised 3D patterns. It holds a generous 1.5 pints (approx. 3/4 mugs) and pours really well. It features an understated floral pattern – a nod to mid-century design. And it makes a simple cup of tea feel that little bit more special.